Meet the newest addition to the B. Family. Isn’t he gorgeous, born just in time for Christmas with his new family and my first session of the new year. We had to move his session to 09 and it was a wonderful day to ring in the new year. Let me just tell you, he was PERFECT. entire session, *posed* just as we placed him and was just the sweetest little guy…born to the sweetest parents. I just adore this picture below, it is the newest addition to a long generation with wonderful history. Someday this little guys wedding picture will be added to that of his grandparents and parents. 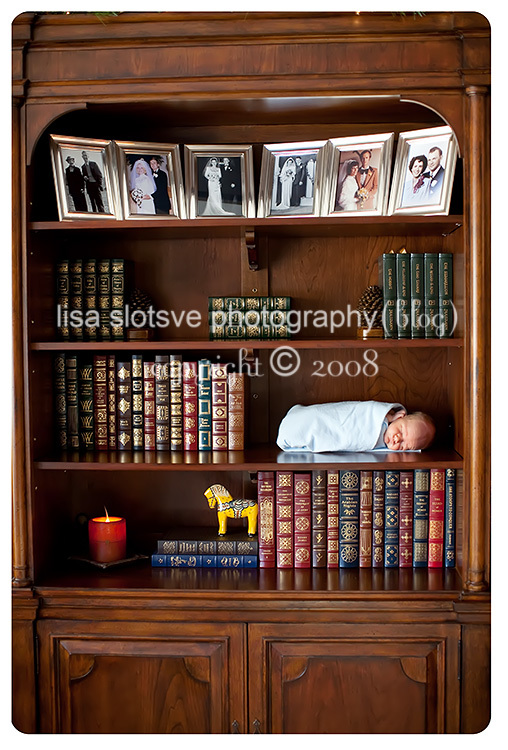 I love how it captures him, a couple weeks old..and all his families other *new beginnings* above him in picture frames. Congratulations B. Family and thank you so much for allowing me to capture his first pictures. Happy New Year! This entry was written by Lisa, posted on January 13, 2009 at 6:27 pm, filed under Minneapolis Baby Photographer, Minneapolis Children's Photographer and tagged award winning newborn photographer in Minnesota, Minneapolis newborn and baby photography, Minnesota newborn and baby photographer, Newborn pictures in Minneapolis, Newborn pictures in Minnesota. Bookmark the permalink. Follow any comments here with the RSS feed for this post. Post a comment or leave a trackback: Trackback URL. Kellie said . . .
love that last shot! beautiful capture! Lisa Kelly said . . .
Just gorgeous images Lisa. I love the chair image the best with the beautiful twinkling lights in the background, just perfect. What a beautiful baby! I love the last shot. B. Family said . . . These images are gorgeous of our son, and we are just so thrilled to see them and have had such a fantastic photo session with you. You were so patient with our son and as you can see by the pictures…you are a phenomenal photographer! Thanks so much for making our son’s first photo session such a breeze. Holli Dunn said . . .
what a precious little one. Gorgeous work! New Image Photography said . . .